The Hubble Space Telescope has been capturing the breathtaking cosmos for over 20 years now, delivering back the richest and most stunning photographs of our vast universe. Back in May 2009, the crew of the Space Shuttle Atlantis launched into orbit to perform essential repairs and upgrades on the Hubble, and onboard was an IMAX 3D camera to capture this incredible space voyage. IMAX Hubble is a captivating new space documentary that takes viewers 350 miles above the Earth to visit the Hubble Space Telescope in all its grandeur, straight from the eyes of the astronauts onboard the Atlantis. Using IMAX 3D technology, and in cooperation with NASA, the space team of the STS-125 Mission were trained how to use the high-definition cameras to film their space repair mission. The result is a mesmerizing journey to space and back that is occasionally gripping, and often times exhilarating. Narrating the entire journey is Leonardo DiCaprio, who is a bit of odd choice given his soft, tempered voice, although you can clearly hear his enthusiasm and excitement. I would have liked to have heard an actor with a more commanding voice, such as Morgan Freeman or Patrick Stewart, narrate the film to give it that extra level of oomph, but DiCaprio's performance is memorable. The audio recordings are nothing short of phenomenal, with no crackling or audio disruptions interfering with the clarity of the astronaut’s voices and shuttle sounds. One of the more memorable audio moments occurs during the Space Shuttle Atlantis take-off, which emits a fiery explosion that sounds about as close to being there as you can get. Peppered throughout the documentary are images and advanced computer visualizations of the universe, including Saturn’s aurora, the Pillars of Creation in the Eagle Nebula and beautiful Butterfly Nebula. The trip even travels to Orion Nebula, spanning 90 trillion miles wide, for a riveting fly-through of the gaseous cloud puffs. These CGI sequences are incredibly well done, and worth watching a few times to marvel at our rich cosmos. The documentary is surprisingly short, running a mere 44 minutes, and you have to wonder why IMAX couldn’t have thrown in another 16 minutes to make it an hour-long experience; however, what’s present is gorgeous and extremely satisfying to watch. 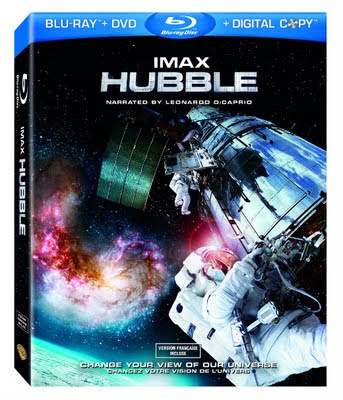 There are some interesting bonus features, such as an “Inside IMAX’s Hubble” which has the cast and film crew talk about their experiences with the project, as well as a “Mission Logs Webisode Gallery” featuring astronaut Mike Massimo who gives us a behind-the-scenes look at being an astronaut. Growing up I've always dreamed of traveling to space and while I haven't yet made it out of our atmosphere, IMAX Hubble is the closest I've been yet. If you're a space nut, this is definitely the documentary to watch.